Three little kittens lost their mittens. I wish to issue a formal apology. In yesterday's post I had a momentary lapse of sanity and forgot to give you a Cute Kitty Photo of the Post. Thanks to River for pointing this out. 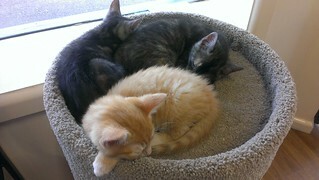 I offer you this photo of three kittens the clinic currently has for adoption, I hope this will make up from my lack of kittens yesterday. Urbane is a fine dining restaurant in Brisbane that has become famous in vegan circles for holding occasional vegan degustation nights. These nights often sell out very quickly, and I had always missed out. A few weeks ago, I was at work when I got asked if I might be free that very night to fill in for someone at the dinner. Ummm... YES! The night was a collaboration between Urbane chef Alejandro Cancino (who won Chef of the Year and is a vegan at home), and raw food cafe owner (It's Rawesome! Cafe on the Sunshine Coast) Susanna Stavenhagen Short. Though certainly not everything was raw. I apologise now for the absolutely appalling photography you are about to witness. The lighting was low, I only had my camera phone and I didn't feel right blinding the people across the table from me with the flash. So get ready for some truly terrible photos. 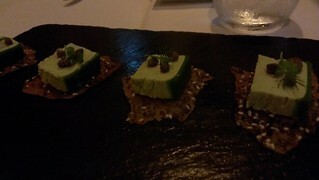 First up was a very yummy Sweet Pea Terrine. This was one of my favourites of the night. 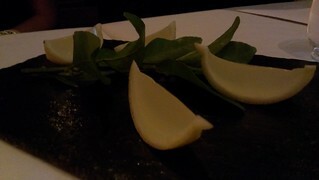 Followed by a yummy and super cute Beetroot Ravioli. Coconut Soup with Teriyaki Almonds. 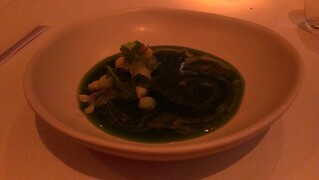 This fell a little bit flat for me, the almond was nice but I found the soup a bit too sweet and lacking in much flavour. 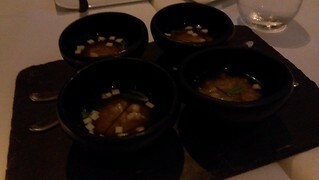 I was expecting Sea Congee to be similar to miso soup, but it had a much more subtle flavour. I found it a little bit watery. Glorious warm crusty bread! Served with sesame butter (not tahini, I am not sure what it was but it was great). I love bread! 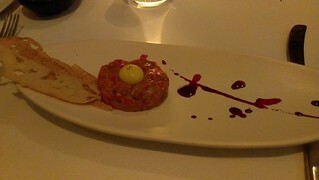 Egg and Toast Tartar was a bit meh for me. 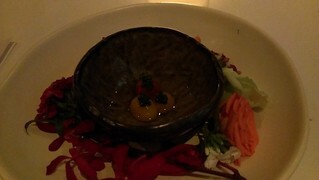 The tartar was made out of minced capsicum, which tasted pretty much like that evil vegetable of doom. I'm not sure what the yolk was made out of, but it was fairly flavourless. I did love the crispy toast, though! This beautiful little combo was called Spring. 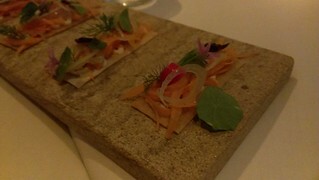 First there was a cracker with pickled spring vegetables, which was then followed by that beautiful bowl of tomato water, tomato and basil caviar. 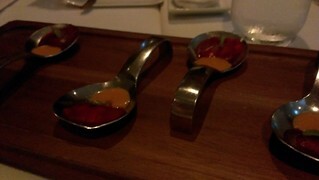 I love tomato water type dishes. This was my absolute favourite of the night! 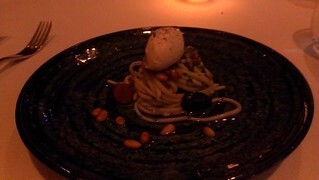 Pasta with healthy dollop of cashew cream, olives and pine nuts. I could have eaten a huge bowl of this. Titled 'Green', this looked much better in person than in this murky photo. I've forgotten some of the elements, but I think it was cucumber water with balls of apple, cucumber and avocado, this was very refreshing. Mushrooms! It is actually called 'Egg: Eggplant, Shimeji, Quinoa'. 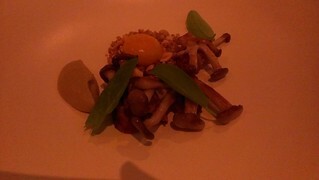 The mushrooms were delicious, the quinoa was crunchy. The egg was interesting, apparently it was made out of pumpkin. 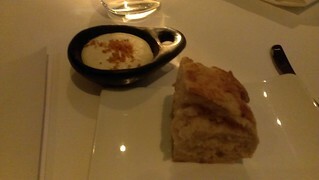 The eggplant mousse was lovely too. Tart and refreshing grapefruit jelly set into lemon peel to cleanse the palate. 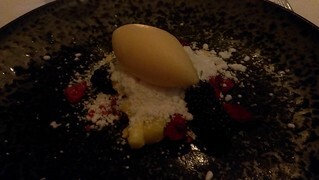 The first dessert was Coconut with Fruits. Freeze dried and fresh berries with some sort of dried coconut (I don't know what they did... it was kind of like they made it into candy but it was just coconut) and grapefruit sorbet. 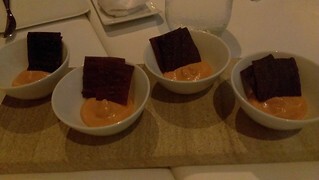 The sorbet was pretty tart, and didn't quite mix with the rest of the dish. I loved the coconut and berries together. 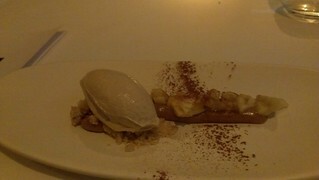 The final dessert was Deconstructed Banoffee. I loved the banana and caramel paste, but the coffee ice cream was not to my taste. But that is because coffee anything is not too my taste, so that is really my issue. 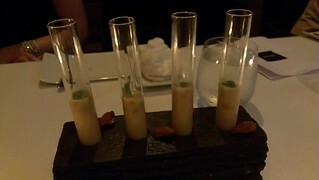 To end we were given a Native Fruit Infusion. I do have a photo of it, but it is so so so bad I just can't bring myself to post it. And this is at the end of a post full of bad photos, so just imagine. It was a cup of sweet, warm liquid. There was a bowl of dried husks in the middle that no one was quite sure what to do with - were they for crunching, dipping or decoration? I was so happy to finally get to attend one of these nights! A big thanks to James for the invite. Also thanks to Pip at work who whipped home to loan me a shirt I could wear to the restaurant so that I didn't have to wear my work clothes to a fancy restaurant!